Mãn has three mothers: the one who gives birth to her in wartime, the nun who plucks her from a vegetable garden, and her beloved Maman, who becomes a spy to survive. 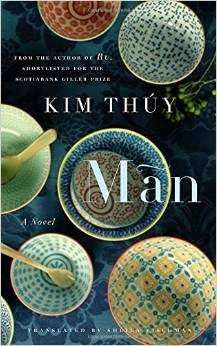 Seeking security for her grown daughter, Maman finds Mãn a husband--a lonely Vietnamese restaurateur who lives in Montreal. Thrown into a new world, Mãn discovers her natural talent as a chef. Gracefully she practices her art, with food as her medium. She creates dishes that are much more than sustenance for the body: they evoke memory and emotion, time and place, and even bring her customers to tears. Mãn is a mystery--her name means "perfect fulfillment," yet she and her husband seem to drift along, respectfully and dutifully. But when she encounters a married chef in Paris, everything changes in the instant of a fleeting touch, and Mãn discovers the all-encompassing obsession and ever-present dangers of a love affair. Kim Thuy has a unique writing style that I found sometimes difficult to follow until I got into the entire rhythm of it. I do know that I enjoyed the fact that her chapters are very short and yet still contain so much detail that is intrinsic to the story that you cannot help but get wrapped up in the yearning of it all. Man is the story of love and a family, however unconventional, and was heartbreaking because of all the things that Man had to go through in her life. Sometimes I found it a little bit difficult to understand exactly what was going on but then I would look at the Vietnamese word for that section and it would somehow tie everything together. These words (and their translations) really are the key to the book. It brings the characters focus back to her origins and each word has great significance in reference to her memories and her current life. So much importance was held in these words that not much needed to be added to complete the story. Man was wistful and sad, full of longing and unfulfilled desire which was spoken about so eloquently that it was still a beautiful tale.